San Lorenzo Plumbing Contractor | Service You Can Trust! Harry Clark has been a San Lorenzo Plumbing Contractor for over 60 years. Harry Clark started a service company called Grand Ave. 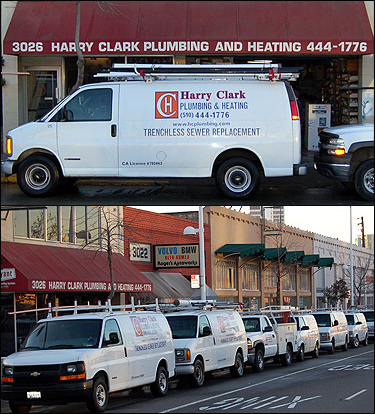 Plumbing in 1946 and later moved to San Lorenzo Ave. Harry Clark along with his wife Madeline, ran a successful company. Some years later Mr. Clark passed away. Madeline Clark, came from a family of plumbers and had worked with her father when growing up. Madeline was not ready to retire, or sell. She applied and succeeded in becoming a California licensed plumbing contractor. She was one of the first in this state. San Lorenzo weather is nice but when the fog or wind rolls in, it is cold. Whether you need service or repair of your old heating system or need replacement with new, Harry Clark is your San Lorenzo Heating Contractor. We are highly rated by the Berkeley Parents Network, BBB, and Consumer Checkbook. We Feature Energy Star Furnaces and thermostats, and out technicians are properly trained. Call for service you can trust. We service and know the neighborhoods of San Lorenzo . We have serviced all of San Lorenzo Neighborhoods. Don and Brad were both born in Hayward and raised in San Lorenzo. Our family home is still on Keller Avenue. We lived, went to school, and worked in San Lorenzo. Nobody knows these home better than us. If you have any questions, please do not hesitate to call us at . If you would like to schedule service online, just visit our service request form. Thank you for your interest in Harry Clark of San Lorenzo, CA!